Many people know Mochi as being the international ice cream sensation that has captivated the world. The truth is that the word “mochi” has actually been used for a long time. What it actually refers to in “Mochi Ice Cream” is the sweet rice dough that surrounds the delicious ice cream. That’s because different types of mochi rice dough have been used for centuries and centuries. In fact, the history of mochi is both storied, and diverse, giving outsiders a unique snapshot of what life was like in Japanese society at different times. Do you want to learn all there is to know about delicious mochi and how it shaped Japanese society, until it became the namesake of the international ice cream sensation? Here’s how it all happened. During Japan’s Heian period, from the year 794 to the year 1185, mochi was used as a treat for people to enjoy during religious ceremonies and around the New Year. The glutinous rice dough was a sign that you weren’t a part of the Aristocracy, except for in religious ceremonies wherein it was consumed by most. Little did they know that someday the sweet rice dough was going to house premium ice cream and become an international sensation. At that point, mochi was just another traditional treat that people ate during special occasions. During this time, mochi was also used as a decoration, called Kagami mochi during New Year’s ceremonies. Many people don’t know this, but a matchbox-sized piece of mochi carries the same caloric intake as an entire bowl of rice. Because of this, Samurai used it during battle in order to satiate themselves for several days without having to carry around too much food. 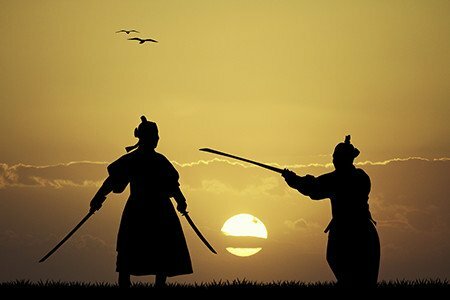 These samurai would prepare their mochi in the days before a battle, then would be able to fight for days with food on hand to be able to continue in battle. In fact, the word mochi comes from the word “motsu” which means “to hold, or to have”. If you needed to be satiated for a long period of time during ancient times, mochi was the easiest way to get it done. Mochi has permeated Japanese society so much throughout history that cooking it has become a traditional ceremony. Wealthier households would prepare mochi to bring good fortune to their houses in the New Year. This is called Mochitsuki, and is now performed by any class of person throughout the year, especially during events like festivals. No matter what you think of mochi, you have to admit that it has a storied past that has shaped much of what Japanese society offers today. It has permeated Japanese society in a profound way that anyone can appreciate. Fortunately, today we get to experience this sweet treat in the form of delicious Mochi Ice Cream, which has grown to becoming one of the biggest sensations in the ice cream industry.